Marie Carmel Garcon, DNP, OCN, CCS, FNP-C is a family nurse practitioner with more than two decades of experience in acute and chronic care. 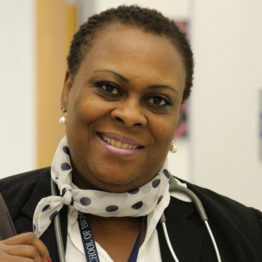 She received a Bachelor of Science in Nursing (BSN) from Dominican College; a Master in Gerontological Nursing (65 and older) from Lehman College; a Master of Science in Nursing (MSN) from Dominican College, and a Doctor of Nursing Practice (DNP) from Pace University. She is board-certified in Family Health by the American Nurses Credentialing Center (ANCC). Marie Carmel cares primarily for adults. Her special interest is to provide comprehensive care for the geriatric population in the comfort of their home. Named Nurse Nurse Practitioner of the Year by The Nurse Practitioner Association of New York State. How was your experience with Marie? Rate and review Marie online.